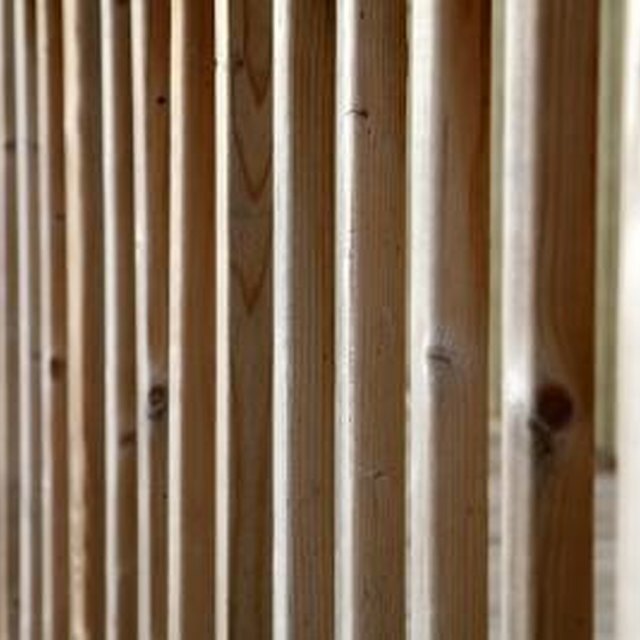 Building codes require installation of fire blocking -- short pieces of horizontal lumber nailed between vertical studs -- in frame walls higher than 8 feet 1 inch, to slow the spread of flames inside the walls. Lumber material is acceptable for code, placed between full studs, usually at the midway point of the wall height. You can shift fire blocking to serve as nailing surfaces for wall coverings, in locations where the studs won't be sufficient. Houses in warm climates, as well as other structures, may be built with 2-by-4-inch walls. The same size of material is required for blocks. New house construction requires fire blocks to be installed. Check local codes for fire stop regulations to determine the placement of blocking. Assess locations where blocks can provide nailing or fastening surfaces for drywall or plywood. Start at the end of one wall, and measure with the tape from the bottom plate to the top plate to find the midpoint. Mark the midpoint on the end stud or corner post with the pencil. Adjust the combination square to the depth of the stud, and place it on the mark, holding the head firmly against the 2-inch side of the stud, with the blade extending across the wide part on the inside of the stud. Extend lines around the stud for reference points for the block. Take the 4-foot level and put it on the midpoint mark. Extend the tool to the adjacent studs, hold it level and mark the midpoint on each stud. Mark reference lines around the stud as in the previous step. Lay out lines where you can use blocks as backing for fastening drywall or sheathing, such as at corners. Substitute these locations for the midpoint blocking for those studs. Continue to the end of the wall, marking where you will install blocks at the midway point. Repeat for each wall. Use the saw to cut 2-by-4-inch pieces from the lumber to fit between studs, usually spaced at 16 inches on center. Fit a block between two studs at the midpoint, using the reference lines. Toenail the block in place with the nails with the hammer, or drive the nails in from the other side of the stud. Take another block, and move to the next stud. Stagger the blocking by shifting the pieces below or above the reference line, for easier nailing. Shift the location of the blocks as necessary to provide nailing surfaces for drywall or sheathing. Make sure the blocks are securely nailed in place. Repeat the steps until all the required blocks are installed for the wall. Continue for the remaining walls. Blocking can be installed before or after the wall is raised. What Kind of Insulation Is Sound Proof? How do I Build a 12 X 15 Deck?